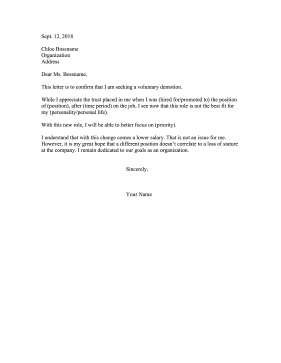 This voluntary demotion letter can be sent to a supervisor upon realizing that the employee would do better in a lesser role. This letter is to confirm that I am seeking a voluntary demotion. While I appreciate the trust placed in me when I was (hired for/promoted to) the position of (position), after (time period) on the job, I see now that this role is not the best fit for my (personality/personal life). With this new role, I will be able to better focus on (priority). I understand that with this change comes a lower salary. That is not an issue for me. However, it is my great hope that a different position doesn't correlate to a loss of stature at the company. I remain dedicated to our goals as an organization.